Mentorship is essentially the process of guidance and training by passing one’s knowledge and expertise on to a mentee. 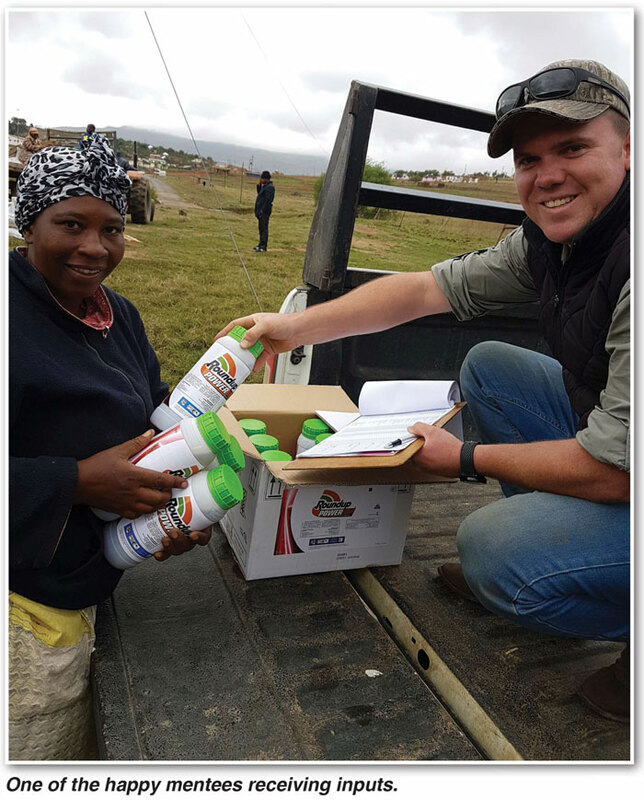 I have been a mentor to roughly 90 subsistence farmers for the past three years as part of the Grain SA Farmer Development Programme seeking to reach out to the farmers in remote, rural areas near Estcourt, KwaZulu-Natal. My experience of being a mentor has been an adventure of growth and enlightenment – I only hope and trust that it has been the same for my mentees. 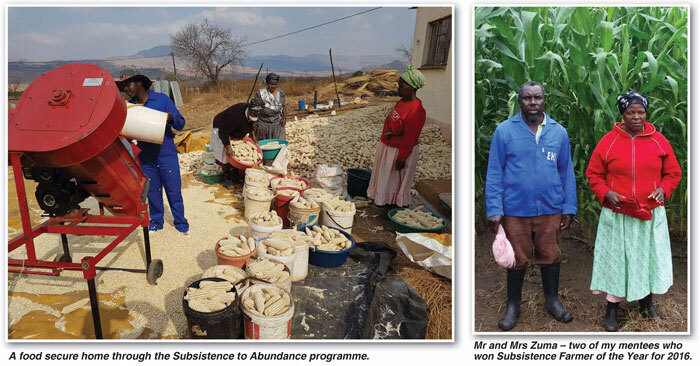 Grain SA’s Subsistence to Abundance project in partnership with The Jobs Fund (National Treasury), Kynoch, Monsanto, SA Lime & Gypsum, Syngenta and the Department of Rural Development and Land Reform has focused on mentorship as one of the cornerstones of the programme’s implementation. As mentors we have been tasked with facilitating the program at grassroots level. We communicate information relating to the programme directly to the farmers. We do logistical co-ordination and planning with regard to input deliveries. 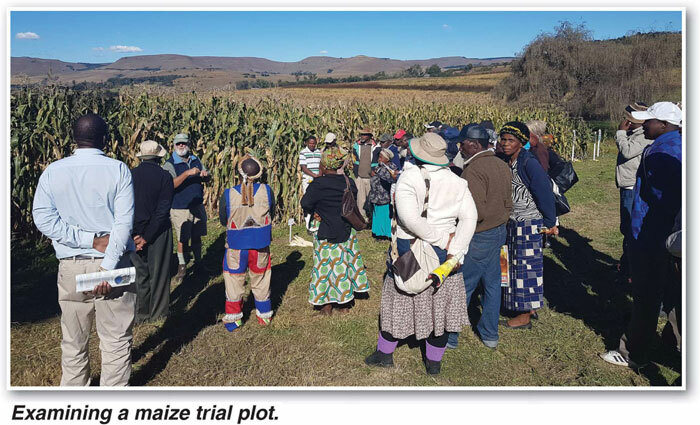 We collect information and data from the farmers for recording purposes and most importantly, we do theoretical and practical training on the principles of maize production in South Africa. This is a lot of responsibility and at times it can be daunting, but with good cooperation and enthusiastic farmers it can be a pleasant experience. As with any programme, where there are many people involved, good teamwork is essential. Facilitating a programme of this size and liaising with a large number of farmers can have its challenges. This is why farmers are divided into ‘study groups’ that are grouped according to location. All the study groups fall under one of Grain SA’s regional offices and are assigned a mentor. We meet with the study groups on a weekly basis at a central point such as a tribal court, church or community hall where we do theoretical training based on an introductory syllabus of maize production. The syllabus covers topics such as maize growth and development, nutrient requirements, planting and harvesting, weed and pest control as well as topics relating to business management such as record keeping, budgeting and marketing. The study group meetings are also a point of contact for the farmers where they can express concerns, ask questions and plan. This is especially useful when it comes to resource management as you will often find that farmers whose fields are located close to one another choose to pool their resources (particularly machinery) to save on costs. At the study group meetings mentors can also use the time to deal with general administration (the Jobs Fund has imposed stringent requirements in this regard, so accurate record keeping and paper work has been a key function for us). After a meeting we will often break off into smaller groups where we can work on a one on one basis and deal with practical topics in the field. Topics such as area calculation, plant population and row width calculations as well as calibration of machinery such as spray rigs, planters and fertiliser spreaders are all covered. I feel the programme has delivered some unbelievable results thus far and I can honestly say that it has been one of the most fulfilling experiences of my life. To see the enthusiastic farmers grow and implement what they have learnt is extremely rewarding. Obviously you will never really achieve a 100% ‘pass rate’. I like to use the analogy of a classroom of school students where on average 20% will perform exceptionally well, 60% will perform well to average and 20% will perform poorly. This is similar to that which I have witnessed in the study group set up amongst the farmers/mentees. And just as a teacher will take pride in those that have put in the effort to achieve good results, so too do I take immense pride in those farmers who make the effort to attend meetings and learn in order to achieve better results. On a personal level, I have grown to better understand the rural and communal set up in our country. My eyes have been opened to the poverty and the inequality which exists in our social structures as a result of our divided past. I have seen the need first hand for assistance, not only financially but also in the form of knowledge. There is a hunger for knowledge and skills at grass roots level which is very exciting. This doesn’t necessarily need to come from an educational institution; it can come from a mentor. I believe that it is the responsibility of all stakeholders in the agricultural sector to form partnerships and continue to provide this type of knowledge transfer – I have seen such positive impacts on so many subsistence farmers. For the sake of food security, community relations, poverty eradication and rural development as well as continued social and economic transformation, this surely needs to remain a priority!